Last week, The National Council for Home Safety and Security named the city of Tehachapi as the safest city in Kern County and the 44th-safest city in California in its 2019 “Safest Cities in California” report. Highlighting its nationally recognized achievements in patient safety and quality, Adventist Health Bakersfield was named a Top Hospital by The Leapfrog Group for the first time, making Adventist Health Bakersfield the only Top Hospital in Kern County. Retirement planning clients often come into my Bakersfield office panicked and frustrated that their nest eggs are cracking under the weight of their children’s mounting college loan debts and helping them cope with financial problems. The San Joaquin Valley is the top agricultural producing region in the nation. Steady growth in hotel industry: Bakersfield’s hotel sector continued to show steady growth in 2018. How well do you know Kern County’s nonprofit community? Al Bensusen’s license plate reads CPAPMAN. Bensusen doesn’t suffer from sleep apnea. He doesn’t need a continuous positive airway pressure machine to keep him breathing while asleep. Numbers don’t lie — unless they are left out of an equation to begin with. When numbers are missing from a calculation, a deceptive void appears like a black hole that swallows otherwise important realities. What began two decades ago as a mere concept proposed by a group of innovative cattlemen has grown into the largest land trust in California. When people think of technology and businesses, they think of large corporations and bankers. In recent months, I’ve become a regular at the Haggin Oaks farmers market organized by the Hens Roost, a company dedicated to providing local food to the community year-round. Cybercrime risks are adversely affecting all business large and small, especially smaller organizations that have taken only minimal, if any, steps to mitigate this risk. Ask many aging farmers when they plan to retire and their response likely will be a blank stare, or a mumbled, vague “maybe in five years.” The truth is that many farmers have no intention of — or plans for — retiring. Pulling up to the headquarters of Crop Management Company Inc., a Delano-area diversified farming operation, feels like coming home. The focus of the complex is a tidy farmhouse, surrounded by citrus trees as far as the eye can see. Christina Santillan may be just beginning her career in education, but she is already excited about helping her sixth-grade students learn about local career opportunities, the value of a job and even the importance of managing personal finances. Remember when you were a child thinking that if you swallowed a penny, a money tree would grow inside your tummy? 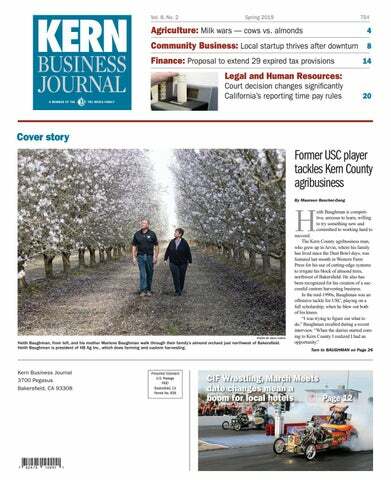 Kern County’s agricultural industry has recently had to absorb a number of jabs. A number of people have been wondering what I’m up to in my new job as advocacy director for BizFed Central Valley. Sometimes you just have to ask, “What were they thinking?” So far it’s been a doozy of a year when it comes to public relations disasters. Employers must learn their ABCs and practice them if they want to avoid legal problems in the wake of a recent California Supreme Court ruling. The test for when a worker can be considered an independent contractor has become a lot stricter. Immediately after passage of the Tax Cuts and Jobs Act, requests from industry advocacy groups for guidance, clarification and/or correction directed to either the Internal Revenue Service or Congress began to pour in. Founded in 2014 by co-CEOs Tom Avinelis and Rob Hurlbut, Agriculture Capital’s focus on is on responsible, regenerative farming and food production at scale. Safe 1 Credit Union received an A-plus designation for the fourth consecutive year from DepositAccounts.com as one of the top 200 healthiest credit unions in the U.S.
June 14 — Labor Law and HR Forum; check-in/networking, 7:30 a.m.; program, 8-10 a.m.; $25 members; $50 nonmembers; Greater Bakersfield Chamber of Commerce, 1725 Eye St. Presenting sponsor: Young Wooldridge LLP; co-sponsor: LeBeau-Thelen LLP.